Everybody knows the (in)famous Dandelion, whether as a hated weed or a beloved food and medicine. Hopefully more and more will come over to the light side and realize the wonders of this ever present plant! Originally a native of Europe and Asia, dandelion was brought over by the Europeans and has been naturalized to the Americas. The entire plant is medicine; the root and leaf are indicated for the digestive system, liver and lymph, while the flower is moving to the lymph. Traditionally and still in practice, dandelion root and leaf are a go to for as a spring tonic and blood purifier. The leaf makes the perfect addition to your salad or as a road side snack as it is one of the first greens to pop up in the spring. The bitter root is best used as a tincture or decoction and is often used as a coffee substitute when roasted. Dandelion is an alterative, meaning it is moving to the lymph and supports the bodies eliminatory organs to work better. Both the root and leaf are used to help stimulate digestion and improve the function of the liver, gallbladder and pancreas. Dandelion enhances the flow of bile and is one of the best liver herbs. Indicated as a “remedy to cool excess heat and thin and disperse surplus fluids in cases that develop slowly” (Matthew Wood). A unique aspect of dandelion that Matthew Wood shares in his book The Earthwise Herbal: A Complete Guide to Old World Medicinal Plants: “Because the leaves contain sodium and potassium the act on both sides of the kidney mechanism: excreting fluids and retaining specific contents. Hence, dandelion leaf is one of the few diuretics that retains potassium and builds up the retentive side of the kidneys.” While Juliette de Bairacli Levy recommends the mineral filled greens as a diet for strengthening the enamel of the teeth, and as a constitutiona remedy for diabetes, obsesity, and excessive sleepiness. Clearly the evidence is obvious, eat more dandelion! Dandelion leaf is perfect added to a leafy green salad enjoyed as the first part of a meal or the root as a simple or mixed bitters tincture taken 15 minutes before a meal to stimulate digestion. As a bitters tincture dandelion root pairs well with yellow dock and burdock in equal parts. The root tincture can also be taken as a general tonic to improve liver heal and function. Dandelion leaf can also be added to tea or made into a tincture. Try also making a herbal mineral rich spice blend to add to salads and soups. Use any combination of the following dry herbs: dandelion leaf, violet leaf, nettles, ground ivy, lambs quarter, or any other wild greens you’d like! Dandelion flower can be used to make a lymph moving breast massage oil. Hannah Jacobson Hardy of Sweet Birch Herbals has a great blog about Violet and Dandelion Breast Massage Oil. 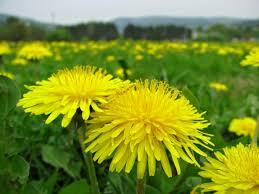 And of course, the flowers have traditionally been used for Dandelion Mead. Here is a recipe from Heartstone Center for Earth Essentials for a Sunshine Dandelion Mead. The flowers can also be dipped into a flour batter and fried to make dandelion fritters. Make the batter, dip the dandelion flowers in the batter and fry in butter. Eat alone or with salad or dip into sauce! This makes for a fun spring time treat. Nutritive spring herbs infused in vinegar make for a nourishing mineral and vitamin rich addition to use on salads or cooked foods. Place herbs such as mugwort, nettle, chickweed, dandelion leaf, parsley, plantain and horsetail in a jar and cover with apple cider vinegar. Let steep for a month, strain and enjoy. If using a metal lid on a mason jar, place a piece of wax paper in between jar and lid to prevent corrosion from the vinegar. Yellow dock is helpful for constipation and doesn’t create any dependency issues. Combine 2 parts yellow dock root, 1 part dandelion root, and 1 part licorice root. Prepare as a decoction and drink 3 cups a day. Vascular headaches are generally the result of too much cold food in the diet and an overly acidic condition of the body. To get rid of a vascular headache, alkalize the diet with salty, contractive foods like brine-cured olives, a cup of miso soup, or a strong alkalizing tea blend. Combine 1 part yellow dock root, 3 parts dandelion root and 2 parts burdock root. Prepare as a decoction and drink 1/4 cup of tea with 1/4 teaspoon of skullcup or valerian tincture every 30 minutes until symptoms subside. This tasty tea doesn’t have the stimulating effects of coffee but it might help you cut back on your daily cup (or not – you don’t have to be cutting back on anything to enjoy this tea). It’s rich, dark and bitter. Add cream or honey to sweeten. Slice equal portions of fresh dandelion and chicory roots. Spread the roots evenly over a cookie sheet and bake for 30-40 minutes at 350 degrees, until the roots are a dark brown. Let cool, then grind in an electric coffee grinder or blender. To use, prepare a decoction of the roots (simmering 25-40 minutes), and drink 1/2 to 1 cup two to three times daily. You can also do a blend of 1/2 coffee and 1/2 dandelion/chicory tea. This combination is excellent cleansing and activating the liver. This tincture is helpful in cases of poor digestion, skin conditions like acne or eczema and other conditions. Make a tincture of 1 part burdock root and 1 part dandelion root. To use, take 1/2 to 1 tsp three times a day. Cautions/Contraindications: Large dose and long term use of the leaf or root may aggravate the stomach due to increased HCl production and may loosen stool.